We have no varieties and not the best climate to grow our own, and there are not interesting farmers markets, selling vegetable, in Iceland. When I got the change to go to a farmers market in Canada last summer I went nuts, the tomatoes were so ripe and beautiful, beautiful because they were not “perfect” looking. All kinds of tomatoes with character. I have been reading about tomatoes in few books lately. 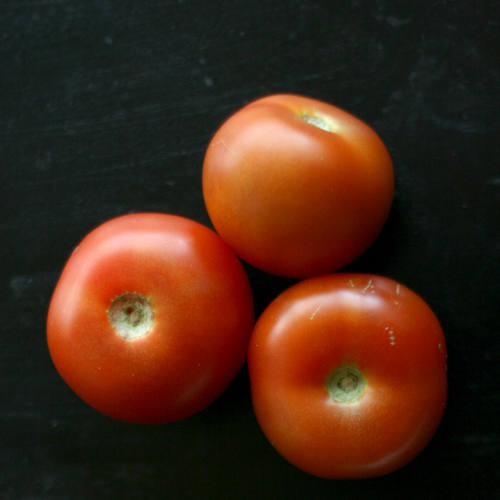 It´s saying that it´s not about how the tomatoes taste that matters, it´s how they look. And organic tomatoes that are not pretty enough, the supermarkets don´t want to buy them so a lot of them gets thrown away. And the tasteless ones that are so hard you can knock out a person with them or break your tiles if you drop them get sold. Because they look “perfect”. (They make them with a tough skin so they can travel 100000 of miles without breaking i guess) If you want to read more about the subject check out a chapter in Animal, Vegetable, Miracle or the book Tomatoland. 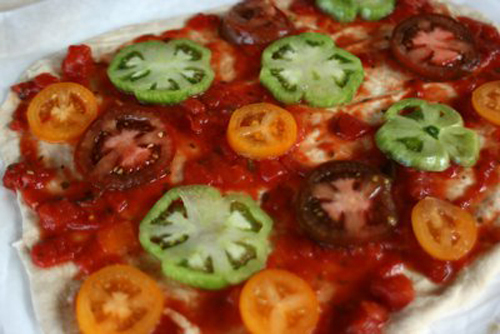 If you get the chance of buying some nice and juicy red, yellow and green tomatoes then you can make a beautiful looking tomato pizza. And what goes well with tomatoes? Mozzarella cheese and some fresh basil. And a little bit of finely sliced garlic is so good. Then a little drizzle of a very good real olive oil, not the olive oil wannabes from the supermarket. Let the yeast foam in a 100 ml of warm water with the sugar. It takes about 5 minutes. I do this in the kitchen aid bowl. Add the rest of the water, salt and flour to the yeast mix. Let your machine work on it for a bit, or knead with hands, I find the less I knead with hands the softer the dough becomes. But I have the machine going for 5-10 minutes. Seal the bowl with plastic wrap and let it rise until it doubles. (I used a double recipe so I got LOTS of dough, but good thing about pizza dough is you can keep it in the fridge for few days and it just gets better the next time you use it). Or you can make a baguette from the rest of the dough. 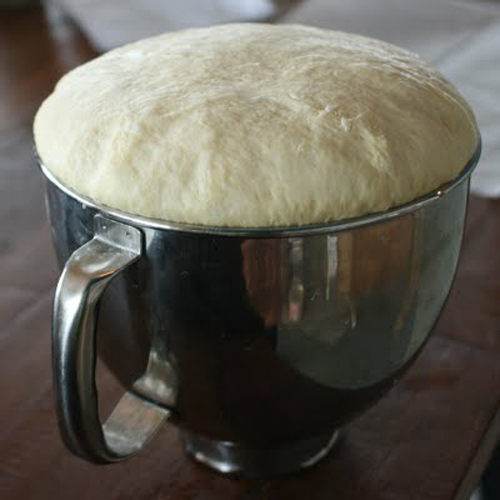 Add a little more flour to knead it down and then flatten out to make pizza. 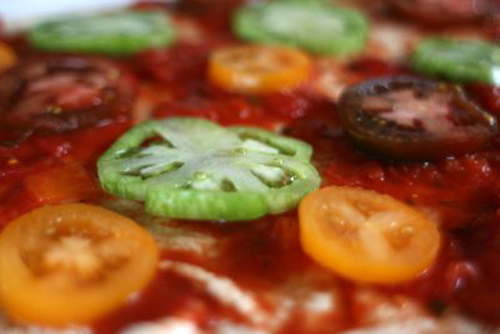 Top it with some crushed canned tomatoes or a nice pizza sauce, the tomatoes, sliced garlic and mozzarella cheese. Bake to perfection. When ready garnish with fresh basil and even some arugula salad, that is soooo good. That looks wonderful. I love the use of different tomatoes. I’ve never seen that done before actually, great idea. i never thought about the ‘tough skin’ concept ~ ew!